Picture Framing Blog - A Good Frame of Mind: Try something new in the New Year: images on canvas! Save 20% Thru Jan 31. Try something new in the New Year: images on canvas! Save 20% Thru Jan 31. Printing on canvas is the on-trend choice for fine-art reproductions because its weight and texture lends depth and complexity to all images, from watercolors to oils to photography. For photographers, it's so easy to take your pictures from the camera to the wall. Simply upload your digital file to our website and we will guide you through the rest. For painters, reproducing your non-photographic art actually starts with taking a picture. 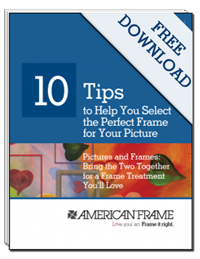 Set up the original piece for photographing, take a digital picture and, once you have an image you are satisfied with, upload it to us via AmericanFrame.com. Printing on canvas is an ideal, affordable way for professional artists to produce reproductions for sale and to create displays for travel. It is also a wonderful option for lending richness to photographic displays, such as travel photographs and family portraits. Be confident--we use the finest quality canvas, a matte 20 mil poly-cotton blend Bulldog brand with a smooth, white, water-resistant surface. Laminating is recommended for maximum UV protection and scratch resistance. Laminate choices are UV matte for a soft finish and UV luster for sheen. Stretch-style and mounting choices include standard, museum and gallery wrap. With our low prices and free shipping https://www.americanframe.com/coupon-codes.aspx, what a great time to give canvas printing a try!